We met in the dark days of winter, in a massive, freezing cold rehearsal space. Liz brought her breakfast in a tupperware box, I brought a cold and a blanket. We began the process of unpacking Liz’s brain. She talked and I wrote for three days and whenever we found a question we couldn’t answer, we used fooling (solo improvisation using multiple personae) to unpack the question. This invariably threw up more questions and by the end of three days, we had covered the entire carpet in paper. The big thing that emerged from this brainstorming session, was Liz’s emerging desire to separate her artistic practice from her participation work. The two have always been tightly bound together, resulting in incredible projects that produce both edgy artistic bounty and carefully thought through participatory aspects, mostly designed for women with mental health issues. 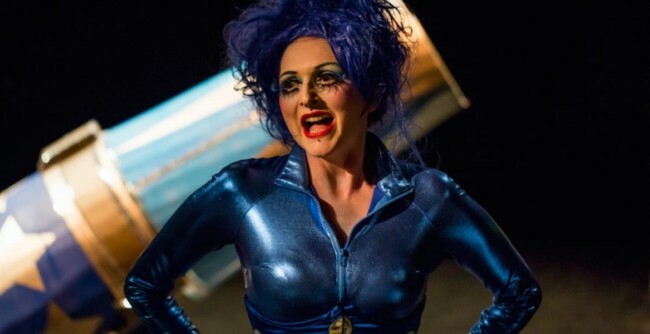 Cannonballista, in its last iteration, was presented as a theatrical cabaret featuring some of Liz’s solo work amongst fragments of work created by participants of Liz’s Superhero Alter Ego Workshop. As an audience member, I found the show funny, risky, meaningful and brave. Zoom forwards 2 years and there we were in that freezing rehearsal room, embarking on the re-mount of the show. But through the three days of brainstorming, it became clear that something had changed. Liz’s inner artist seemed to have grown; she needed more space to explore and express. So the decision was made to separate out the participation part of the project from the show. As a tie-in with the show, Liz will run the workshops, but they will be a private journey for the participants, instead of ending in a performance. We both agreed that taking away the pressure of public performance could potentially result in safer and even more meaningful experiences for the workshop participants. So we redesigned the workshop to focus purely on the process, drawing from Liz’s own artistic / healing experiences. Watching Liz’s inner artist take her space over the last 6 months has been a beautiful and inspiring journey. We’ve played together for a few days every month and pretty much every time, Liz has arrived with a million reasons why we should definitely not make the show. Each time we’ve used ‘fooling’ to explore all the contrasting internal voices at play, until we’ve named all the fears and made sure the artist feels supported enough to play. In our time together, I’ve facilitated Liz in her exploration of grief, coping mechanisms, how to live a sustainable artistic life, shamanism, burlesque, playful audience interaction, B-movie making, working with live music, storytelling, movement, dance and bringing live art into theatre and theatre into live art. The show is an awesome product of this intricate patchwork process, held together with laughter, tears and mystery. I love it and I do hope you can come and watch it. For details of the Super Hero Alter Ego Workshop, see Liz's blog.